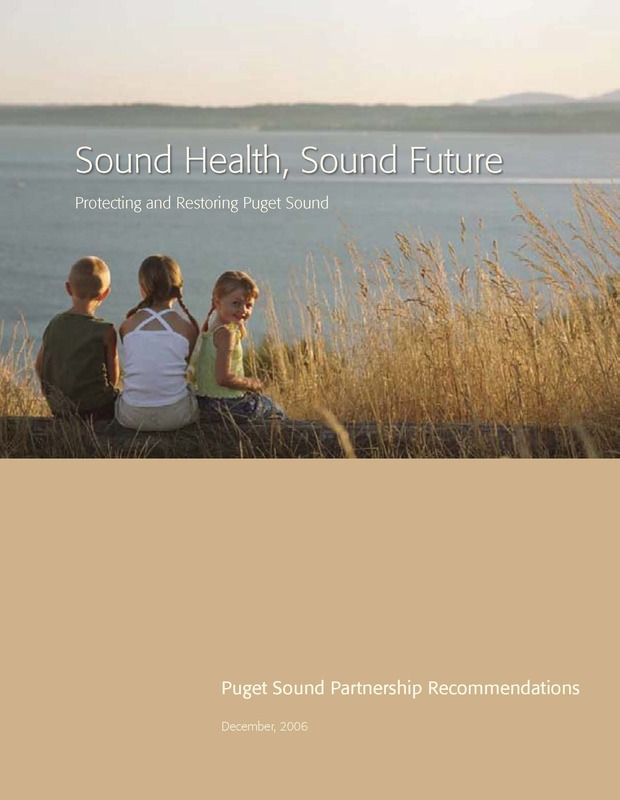 The Puget Sound Partnership reached consensus on and is pleased to submit our final recommendations in response to your charge that we “develop recommendations for preserving the health and ecosystem of Puget Sound, and to help educate and enlist the public in achieving recovery of the Sound by 2020.” We believe our work lays a new foundation for a healthy Puget Sound. A complete 2020 Action Agenda that links actions to results across the region. While much of this work should continue, our essential priorities show what is needed for a healthy Puget Sound by 2020, and our immediate actions show where progress should be accelerated right now. As requested, we have identified five areas in need of immediate State attention and leadership: cleanup areas with immediate septic problems; protect Puget Sound habitat; implement priority projects to restore our damaged forests, rivers, shorelines, and marine waters; accelerate control and cleanup of pervasive toxic pollution; and significantly reduce polluted runoff. A long-term approach to both raise public awareness and build on a regional tradition of community action and involvement. This includes a multi-year public awareness campaign and support for new education and engagement efforts that build on and tie into existing efforts, as well as strengthen education programs and efforts to recruit, train, and engage citizen volunteers. A new governance structure that provides visible, trusted leadership across the region, and is accountable for results. While our current system results in positive actions, we lack accountability for action and results needed to have a healthy Puget Sound by 2020, the capacity to resolve conflicts and conflicting mandates, and the ability to use scarce resources efficiently. We recommend a new leadership council and implementation board of affected parties to be the center of this new approach. Significant increases in funding from all levels of government, as well as private sources, foundations, and non-traditional means. This will enable both the recommended new governance entity and each of the sectors to step up and meet the challenges. While our recommendation of an adaptive management approach will improve the effectiveness of current expenditures, substantial additional resources will be needed. A major increase in funding from the State in the 2007-09 biennium budget will help accelerate progress immediately. This investment by the State would stimulate additional contributions from other levels of government. The Partnership strongly believes that the State’s investment, which is already significant, will need to be augmented by a long-term, dedicated revenue source of substantial magnitude to meet the doubled or tripled investment needed. This revenue source should be identified as soon as is feasible. Local government contributions to the Sound’s recovery have been and will continue to be considerable and the action called for by the Partnership will require further effort on their parts. Cities and counties will need flexibility and creativity in implementing their responsibilities under the Plan, and to raise their share of revenue. The federal share should be significantly increased, consistent with the Sound’s environmental and economic importance. Private interests will continue to have responsibilities to meet the requirements of existing laws for pollution control and cleanup, and will be an essential partner in developing and implementing innovative approaches to address remaining and emerging threats. A Clear Role and Structure for Scientific Input. The new governance structure would have a science advisory committee that is also connected to the Washington State Academy of Science. This will allow for coordinated scientific input as well as collaboration between scientists and policy leaders. Urgent and broad-scale actions are needed now and into the future if we are to leave a legacy of a healthy Puget Sound for future generations. The Partnership has been moved and impressed by the publicly-voiced deeply held passion and commitment for Puget Sound. This past year has sparked hope and lively discourse about what actions will really make a difference. We believe that these discussions must continue so that we learn to act as region. This report was published by a Puget Sound Partnership blue-ribbon panel co-chaired by Governor Christine Gregoire, represented by Jay Manning, Director of the Washington Department of Ecology; Bill Ruckelshaus, Chairman of the Salmon Recovery Funding Board; and Billy Frank, Jr., Chairman of the Northwest Indian Fisheries Commission.